DMC has created a new line of jewelry kits featuring the DMC Desire threads. These quick and easy kits include everything you need to transform threads, ribbons, beads, and charms into creative pieces of jewelry. You'll find 3 new DMC Desire Jewelry Kits in the Jewelry Kits section of the stores. Making jewelry is a great way to share time with family and friends, catching up on the latest news and creating something new together! These kits are ideal for beginners and fun for anyone looking for a creative weekend craft project. You'll create a modern piece of jewelry that you can wear any day of the week! We also have 2 new Complete Beginner Jewelry Kits from Walter Foster. They're called Fashion Your Own Wire Jewelry Kit and Fashion Your Own Your Own Beaded Jewelry Kit. These kits include the 3 basic jewelry tools and all the beads & findings you'll need to get started making your own jewelry! Creating your own jewelry is fun and rewarding. These kits teach you the basic techniques you need to get started making jewelry with confidence. You'll enjoy wearing your finished jewelry pieces or giving them as special hand-made gifts. Learning a new skill is so easy with kits to help you get started. Weekend Kits offers kits across a variety of craft categories. Select your favorite kit today and be ready to create something new on your next Weekend at Home! 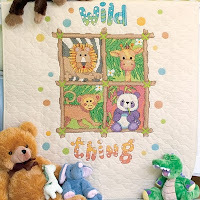 We've added a new Baby Quilt Stamped Cross Stitch Kit from Dimensions to our Embroidery Kits section. The design, called So Sweet, features a bright beaming sun, flower, and butterflies. This quilt would be such a cheerful addition to baby's nursery. Make sure to see the matching So Sweet Baby Bibs Kit! Stamped embroidery kits include a pre-finished quilt, embroidery floss, and needle. Add an embroidery hoop and you're ready to get started. These kits are enjoyable to make and rewarding to give! I have a learn-to-knit internet resource to share with you today. It's the Craft Yarn Council of America's Learning Center. Click on the Learn to Knit link for step-by-step instructions with diagrams. This is a great site to get you started knitting with confidence! Kits make learning a new skill convenient and fun. Explore new craft areas at Weekend Kits and get ready to learn something new on your next Weekend at Home! You'll enjoy our new Punch Needle Kits, including 4 new designs from Dimensions. These punch needle embroidery kits use contemporary colors to achieve a modern look. It's easy to see why punch needle embroidery is gaining new popularity as a creative Needleart craft. It's relaxing and fun, making it a great weekend craft project. You'll find these new designs and more in the Punch Needle Kits section of the store. These kits include foundation fabric with pre-printed design, embroidery floss, and easy to follow instructions. If you need a punch tool or embroidery hoop, you can find them in the Punch Needle Supplies section of the store. We've added to our selection of Stamped and Counted Cross Stitch Kits in the Embroidery Kits section of the store. You'll find the Wild Thing Baby Ensemble, including the Baby Bibs, Baby Quilt, and Baby Birth Record kits. This is such a fun jungle-themed kit collection for baby! And, if you enjoy both embroidery and quilting, you'll want to see the Year of Flowers Lap Quilt Embroidery Kit by Donna Dewberry. This beautiful lap quilt, celebrating flowers throughout the seasons, will become a lasting heirloom for your family to enjoy throughout the years. You can explore these creative project kits and so many more at Weekend Kits. As always, thanks for visiting the Weekend Kits Blog. Get ready to be creative on your next Weekend at Home! Creative & Colorful Knitting Kits at Weekend Kits! Knitters will enjoy our newest collection of creative knitting kits from Knitwhits. These colorful knitting kits include patterns with instructions and enough yarn to complete your project. You'll find them all in the Knit & Crochet Kits section of the store! It's not too late to knit up one of these super soft chunky wool hats to keep yourself or a loved one warm this winter. The Phoebe hat knitting pattern & yarn kit is available in 2 color choices - Snow Wool Hat Knitting Kit and Stone Wool Hat Knitting Kit. Pattern includes sizes for adult, child, and baby. And, it's not too early to think about projects for spring. The colorful Easter Eggs & Basket Knitting Kit will brighten up your winter days. This felted knit basket filled with Easter eggs would be a creative centerpiece for a dining table or could be used as spring decor in any living area of your home. These felted embellished eggs are a crafty weekend project! If you've ever thought about knitting your own handbag, we have two new knitting kits that will make it so convenient for you. You'll want to see the Marit Felted Purse Knitting Kit and the Patch Cotton Purse Kit. These modern handbags are a stylish knitted accessory that you can use every day! And, don't forget a knitted treat for your cats! The Tigger Toys Felted Knit Kits in Belle and Punk are sure to be a hit with your feline friends. For crocheters, we have a wonderful new Ruby Scarf Crochet Kit for you to enjoy. The colors in this scarf are beautiful. The scalloped trim and tassels are decorative and fun! Knitwhits kits are ideal for advanced beginner to intermediate knitters. If you're new to knitting, we have a nice selection of beginner knit kits for you in the store and there will be even more colorful & fun learn-to-knit kits coming soon. You can get the details on all of these kits and more at Weekend Kits. Get ready to create something new on your next Weekend at Home!